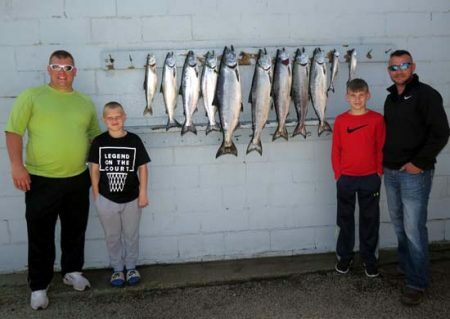 We fished north of Ludington today setting up in 110 feet of water (fow) . There weren’t many marks on our screen but we only had a few rods set when the first King of the morning took an 11″ White Crush Paddle/Pickled Sunshine Action Fly 85 down on the chute rigger. We just landed that fish when another King hit a low wire diver out 85 with a 10″ Blue Bubble Spin Doctor/Ice Cold Big Water Meat Rig. That set up went twice for us and was our only meat bite. They wanted spoons today. Both our 10 color cores went twice. We had a Yeck Wart Frog on one and UV Two Face Super Slim on the other. We caught a small throw back King on a 5 color with a Yeck Fire Ball and a keeper King on a 7.5 color core with a Yeck Jered. We lost a good one on a 175 copper with a Mag Dreamweaver Magic Man landed one on our 200 copper with a Mag DW UV Mixed Veggie. Our 250 copper with a glow spoon took four Kings. 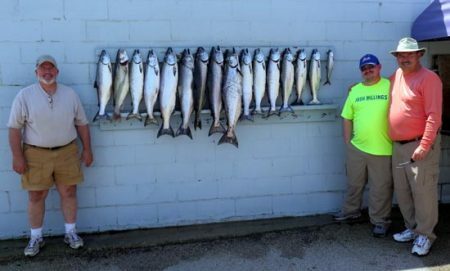 Most of our action came on the boards but we took two Kings on a Yeck Glow M &M down 65 on an out down and a good size Trout on an 8″ Chrome Spin Doctor/Mountain Dew Yellow Dot Whirly Gig 135 down on the chute rigger. We lost a big King on that set up too. 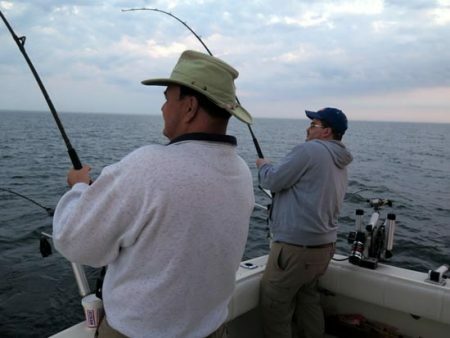 We had steady action all morning and took most of our fish north of the Point. We ran a double today. 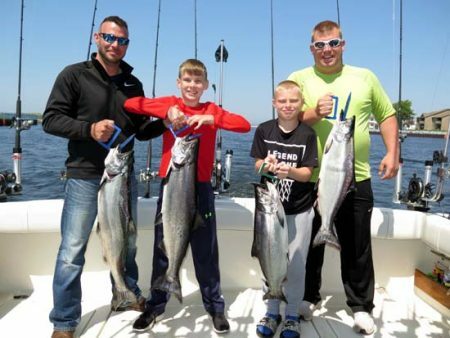 Some boats had nice catches of Kings Saturday south of Pentwater. It’s a long run for us but we decided to give it a try on our morning trip. We only had 4 rods in the water when we hit a double. An out down set at 60 with a pair of magnum glow spoons and the chute rigger down 75 with an 11″ White Crush Paddle/Pickled Sunshine Action Fly both fired. We boated both Kings. We had the other out down set at 65 ft. with a pair of Magnum Fuzzy Bear Yellowtail spoons that went 3 times. We missed 2 of them and boated 1. We took a King on a low wire out 90 with an 8″ Kevin’s Girlfriend/Ocean Mist Action Fly and took another one on the other low wire out 120 with an 8″ White Green Prism Spin Doctor/Pickled Sunshine Dreamweaver Meat Rig. We only had 1 high wire diver bite and that came on a 10″ Netminder Showtime Spin Doctor/Liven The Dream Dreamweaver Meat Rig. We had bites on 200, 225, & 300 coppers. Our trout came on a Chrome Spin Doctor/Mountain Dew Whirly Gig bouncing bottom on the chute rigger. Some fish seemed to be moving north so on the afternoon trip we sat up between the project and Pentwater in a 100 feet of water and trolled southwest. We didn’t have a bite for the first 3 hours of the trip. 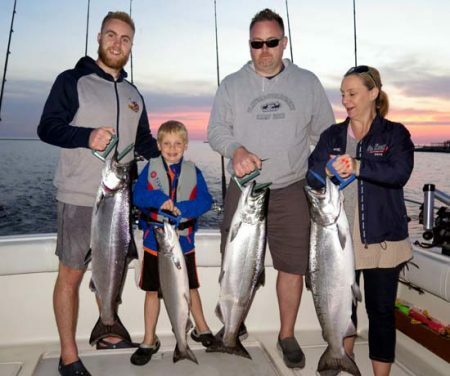 We final took a big King on a 200 copper with the same 8″ Kevin’s Girlfriend Spin Doctor/Ocean Mist Action Fly that took a King on our morning trip. We were slowed way down because the fish ran out so much line when our 225 copper with a Mag Dreamweaver UV Mixed Veggie took off. We got’em both. We circled back around and took another pair of Kings. One on the 225 copper with the Mag Mixed Veggie and the other on a Mag DW Magic Man on a 175 copper.